Our Giant Jenga tower starts at 5 ft tall and grows to over 10 ft and includes 108 Blocks to make (36 rows) and even includes a custom dry erase board to make your own Rules. The object is to pull blocks out of the center of the tower and replace them at the top without the tower falling over but everyone knows this is not easy. 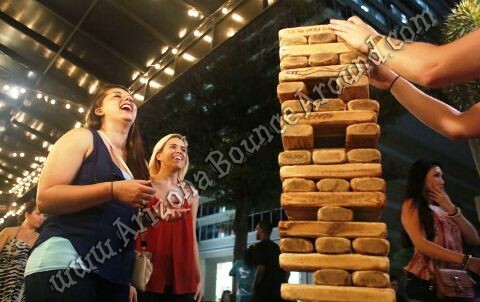 Our Giant Jenga game rental is one of America's favorite party games perfect for school carnivals, team building, company parties and more. Our giant Jenga game rental does not include a table and will be easier to play if you use a table. It will look really nice on one of our wine barrels. 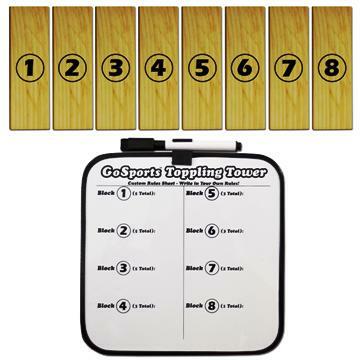 Our Giant Jenga game includes printed numbers on the bottoms of some of the blocks with a corresponding custom rules sheet. These numbers correspond with a special set of rules that make the game even more fun! For example, you may pull a block and then see it has the #6 printed on the bottom and this would mean you follow the # 6 rule which can be anything you want (skip your next turn / reverse order / draw another block / etc). The rules sheet is a dry-erase board so you can create your own rules as you go or to fit your party theme. 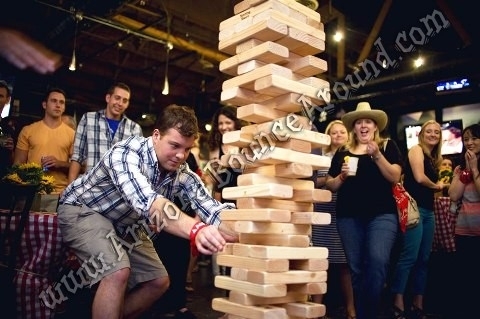 This is by far the best giant Jenga toppling tower game available for rent in Colorado.